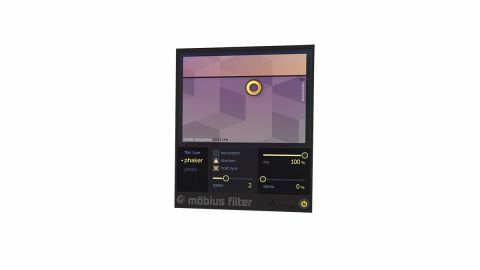 Mobius Filter is very specific in what it does, but what it does is awesome, and is endlessly (pun intended) useful as a treatment for all manner of sounds. Two filter modes. X/Y Pad to tweak filter. Great value for money. Only really does one thing. Every now and then a software developer taps into a bit of forgotten science and really impresses us with the result, and iZotope's latest could be one such example. Mobius (VST/AU/ AAX/ RTAS) takes the Shepard tone concept and cleverly applies it to a filter, for what iZotope calls a "perpetual motion machine", giving the impression of an infinitely rising or falling sweep. Significantly, it does this across the full frequency range, thus differentiating it from your typical filter effect, where removal of frequencies is the norm. Mobius has two filter modes - Phaker and Peak, the former applying both frequency dips and peaks, the latter just peaks. Phaker is the 'stronger' effect of the two, although, in general terms, they're actually pretty similar. The filter movement can be set to up or down, with either free (0-10Hz) or synced timing (8 beats to 1/8). Alternatively, hitting the Movement pause button switches to manual control of the filter Centre Frequency and Resonance via the X/Y pad. Rounding things off are Mix blend and a Stereo width control, the latter using mid/side rebalancing to enhance the stereo aspect of the signal. There's not a great deal to the Mobius interface, then, but how does it sound? The character is much like that of a phaser, although a phaser gives the impression of rises and falls, whereas here the effect is decidedly one-directional. Unsurprisingly, Mobius sounds great on pads, textures and other typical phaser candidates such as electric piano. It can also add interest to drum kit overheads and beat loops, aided by the fact that it retains the full frequency of the original sound. For pads, the gentler Peak mode delivers just a little subtle movement, while electric piano can easily handle plenty of the stronger Phaker mode. Similarly, acoustic guitar sounds great with the Peak mode, and electric guitar shines with Phaker mode. If you use noise-based risers and falls in your music, Mobius offers a viable alternative to regular filtering, and we got great results matching the direction of a filter sweep to the movement of Mobius, as well as sending them in opposite directions. However, for us, the key to getting good results lies with the X/Y pad, as this not only influences the filter centre frequencies but also the Resonance. With the Resonance cranked up, the results are akin to a phaser, as already described. Set the Resonance to minimum, though, and the effect is very mild, providing a great alternative to more swirly modulation effects like chorus. Overall, Mobius is definitely a one-trick pony but, nonetheless, an effect plugin that anyproducer should want to have in their toolbox. It can do subtle, unsubtle, and plenty of things in between. If we have one gripe, it's simply that we may well be tempted to use it far more often than is strictly healthy - we can't think of a better endorsement than that.